As I continue to search for chat rooms where I am able to be actively involved with the senior citizens, I find that the more chats I venture into, the more inappropriate seniors I find. PUBLIC SERVICE ANNOUNCEMENT: An increase of age can bring on an increase in inappropriateness. I was shocked to read some of the comments that come out of these seniors mouths! Although a lot of the websites write up a list of rules, it doesn’t stop some of these adults from saying some vulgar stuff. The last chatroom I participated in was on senior-chatroom.com. This website was interesting because you could participate in a big chat with anyone who is online, but also have a personal audio-video chat. I found that when I was on this site almost every member sent out a request to have a personal audio/video chat with me. I wasn’t comfortable saying yes, but I have included a shot of what it looks like when someone sends a request. 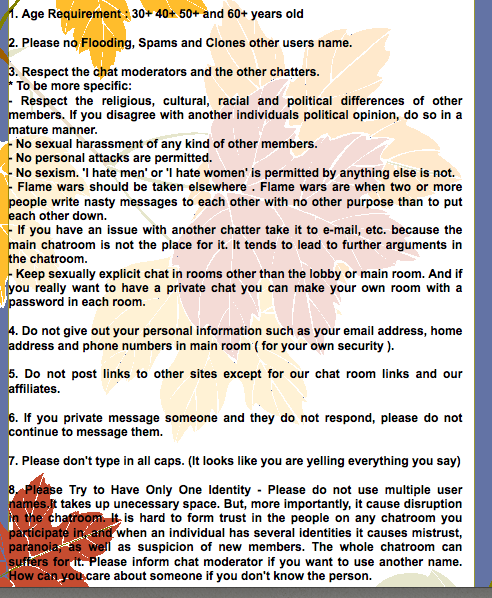 Since my experience with chat rooms hasn’t been at all positive, I decided recently to venture into discussion forums and see what I could find there. I think there is a large difference in discussion forums than chat rooms, and seniors get different outcomes from each of these choices. 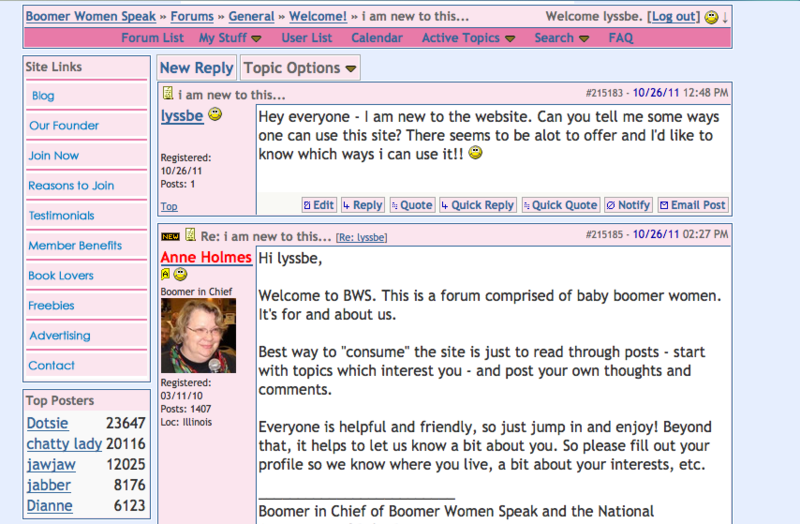 I joined a website called, Boomer Women Speak, and have observed a variety of forum topics from “Widows” to “health problems”and tried to get a good understanding of how senior citizens use these communities in their lives. Seeing the different discussions allows me to see how personal people become on the internet. These women have used this website to get through traumatic life situations and also to just talk about their feelings. It is really special to go to a place where they can talk to women who are experiencing the same types of situations they are going through. I wanted to personally be involved so I decided to post a message on the welcome site to see if anyone had anything to say to me (I included a screen shot below) and the “boomer in chief” responded back. I also personally messaged one of the “top posters” named “chatty lady.” I am waiting for her response back but I will be sure to keep you updated. I am liking this forum environment better, but haven’t given up with chats just yet!